Why Is Today Different from the Internet Boom? What Makes Today Different from the Internet Boom Years Ago? It’s almost 20 years since I was sitting (with an equally youthful Marc Benioff) at Microsoft’s Internet launch in 1995. Netscape was the runaway leader, the rest of the tech industry was scrambling to catch up… and everyone else was trying to figure out how the Internet would impact their business. Companies that embraced the Internet experienced dramatic growth. Those that didn’t died. Don’t believe me? 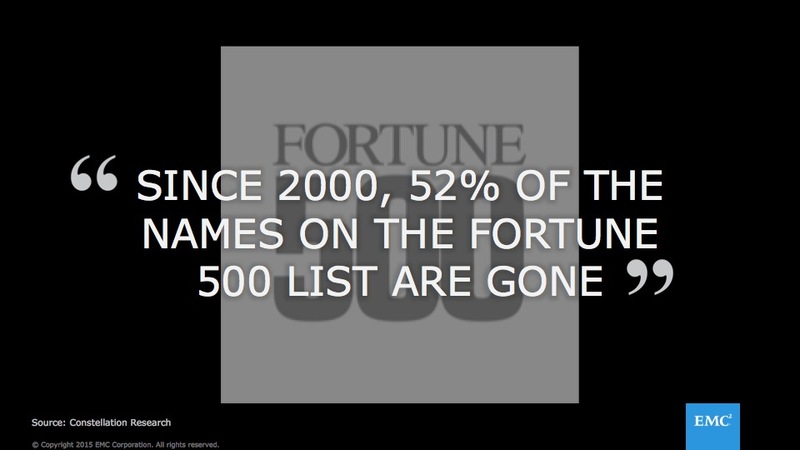 Just go back and look at the Fortune 500 where 52% have disappeared right off the list since 2000. Once again, we find ourselves on the precipice of a massive change, one driven by the advent of a digital world, built on a mobile/cloud platform. 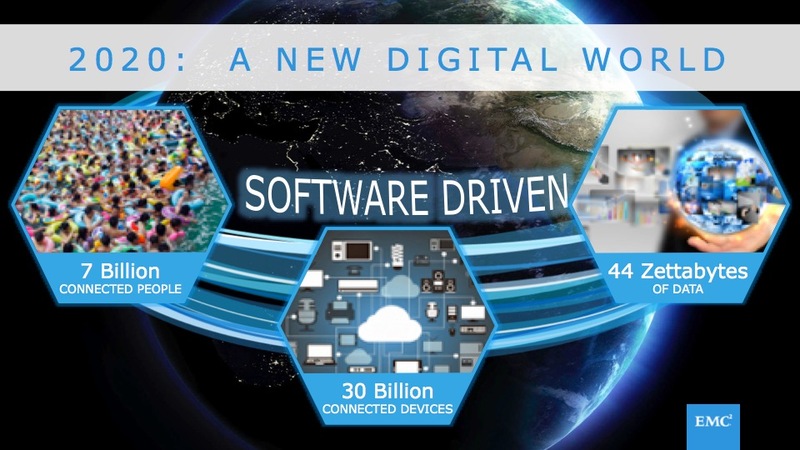 The numbers are staggering – by 2020, there will be seven billion people connected to the Internet on 30 billion devices, generating an astronomical 44 zettabytes of data. And just like the PC-Client/Server driven Internet boom that preceded it, the digital world will be a massive opportunity for those businesses that embrace it… and a tertiary-cretaceous boundary for those that don’t. So the macro-level business threat is the same, but what’s different? The simple answer is “everything else”. Lets start with the basics. The difference in numbers of users and volume of data are clearly apparent – take for example the insurance industry. If you’re in an accident, you no longer need to call your insurance company to file a claim. You can use an app to take pictures, then submit a claim directly to get your car fixed more quickly. Rather than a few hundred people in a call center entering a few hundred K of data per customer, millions of consumers now add tens to hundreds of megabytes directly through an app! Now, when you consider that service companies in every industry will deliver similar consumer experiences you can see why scale shifts to billions of users and zettabytes of data. I won’t even mention product companies (think GE, Tesla, John Deere, BMW, EMC, etc.) making their products “smart” and generating data in real time to better personalize, improve efficiencies and be more predictive. What about the architecture of these new apps? It’ll be fundamentally different too. To support massive volumes of users and massive volumes of data the architecture has to change. Apps will be decomposed into a number of microservices that, often with support of a Platform-as-a-Service (PaaS), will be scaled, updated and deployed automatically – without loss of service to the consumer. The application infrastructure will be inherently distributed and scale-out in order to support the crazy user counts and storage will move to a software-defined on commodity model in order to support exabyte-scale at an economical price point. As technology companies wake up to the power of community-based development, open source will become much more prevalent but most will still pay a premium for a complete working system with service level guarantees. What about the development model? Different again. Throw out your books on the SDLC and waterfall development (I know, many of you already threw them out) and get a new set based on agile and extreme programming. Many of us have lived the “death march” release after release and endured the pain of watching while quality misses the mark and the feature set comes up short. Done right, agile delivers a level of transparency waterfall never could. Combine that with the fact that change is now built into the development process and you arrive at a level of responsiveness and productivity that inspires teams instead of killing them. And release process? Yep, different too. The “big bang” release thrown over the wall and the ensuing fight between development and IT operations (for an application that has poor quality and very few of the right features – see above) is dead. Consumers are fickle, companies need to understand application usage, iterate on functionality and deliver a better, more personalized experience over time. Development cycles are no longer measured in months and years, but days and weeks. Development and Operations much approximate to being one and the same – hence the rise of DevOps. Finally, what about the process for managing apps? You guessed it – different again. Let me use an analogy that my friend Randy Bias made famous. Today we treat applications like pets – we name every one of them and when they get sick, we use every tool at our disposal to nurse them back to health. With our new distributed, scale-out apps we don’t do that. We treat our applications more like chickens. Instances hatch like crazy as the application scales… and when an instance gets sick, well… you know what happens. Let me just say there is no vet involved. In coming months and years there will be much talk about the new Digital world and the new “Cloud-Native” infrastructure and models that will be used to support it. I suspect there will be a healthy dose of “Cloud-Native”-washing going on along the way. While a pragmatic roadmap and journey to the new world is essential, we should also not shy away from the fact that the new digital world and underlying infrastructure will be different. Different technology, different processes and different skills. Embrace what’s going to be ‘different’ in your IT shop and ensure you’re part of helping the business be in the 48% when 2020 comes around! Big wave Eddie is coming. Let´s get ready to surf.